The ancestry of the Irish Terrier goes back into the mists of time, and long ago it was used by the Irish farmers as a worker, a guard dog for the family and a wonderful companion. It has a heart three sizes too big for its shaggy body; a heart that is as white and clean as that of a knight-errant. There is a psychic side of the Irish Terrier too, found in almost no other dog, a tinge of the mysticism of the land of his ancestry. The Irish Terrier can live to 15 years. Owners must realise they are taking this lovely breed on for its lifetime. As mentioned, they are a wonderful companion, intelligent, affectionate and a great family dog. They make a good show dog although most people who purchase an Irish Terrier want them solely for their happy and fun nature. They can be trained at an early age to be an obedience dog. They can be equally at home with cats, birds and other dogs, although if a male he does not take kindly to other outside males on his property. 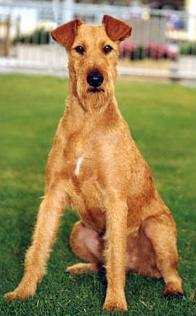 The Irish Terrier has a double coat – a soft undercoat and a harsh top coat. Daily brushing and a good comb will keep the coat in good condition but it does need regular "stripping" or clipping. If not being shown, the coat can be clipped every five months but if they are a show dog, regular stripping is needed to keep them looking in excellent condition. 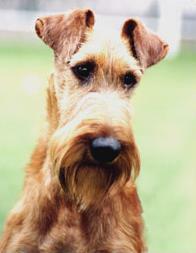 Either way, keeping the Irish Terrier looking good can be done by the breeder who normally offers after sales service. Eyes, ears and mouth should be checked every week, or each day in the case of eyes. Please also remember to give your dog their daily or monthly heartworm treatment and a booster vaccination every 12 months. The Irish Terrier is a healthy dog and does not suffer with any major problems. Single people, married couples, or families looking for a loving and devoted companion.